iTunes is a popular iOS file management tool that lets your play audio/video files and organize them in its library. 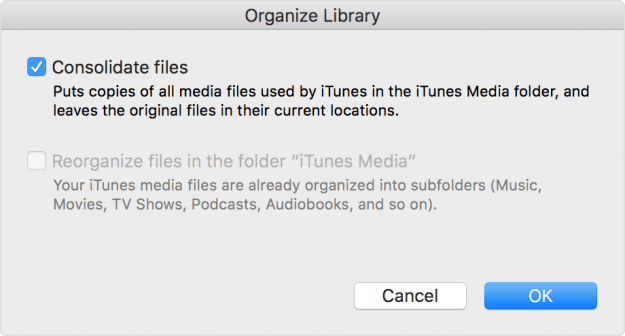 There are many options available when it comes to organizing your iTunes library and one of those options is consolidation. iTunes consolidate files creates copies of all of your media files in the library into a single folder on your computer’s hard drive. Following are some instructions to consolidate iTunes library. It is recommended that you back up your iPhone files before attempting to consolidate them. Step 2: Navigate to Preferences and select Advanced option. 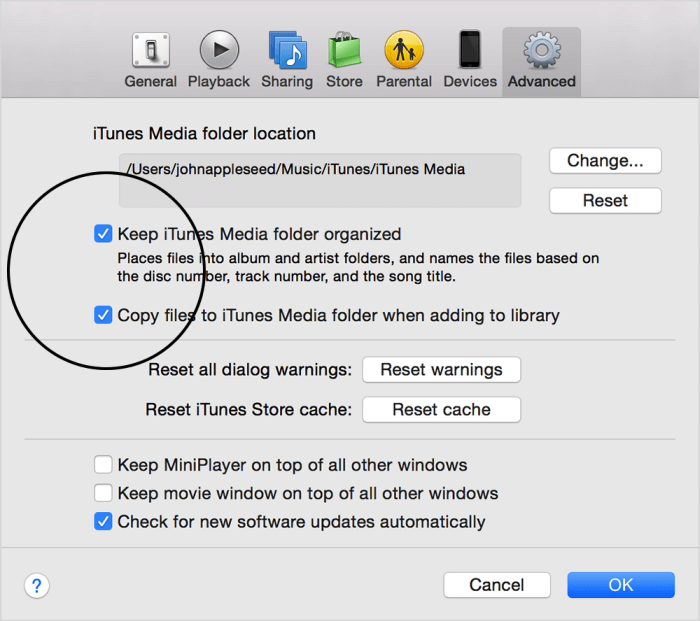 Step 3: Once you are in the Advanced menu, find “Copy Files to iTunes Media folder when adding to library” and “Keep iTunes Media Folder Organized” options. Step 4: After locating those options, tick the checkboxes next to each of them. If they are already ticked, then just keep them. Step 1: Launch iTunes and click on File > Show Menu Bar option. It will display an advanced menu bar in your iTunes. Step 2: Now click File again and choose the Library option from the menu. You will see a number of options after you select it. Find and click on Organize Library option. Step 3: Once you click on that option, two options will become available i.e. “Consolidate files” and “Reorganize files in the folder iTunes Media”. Tick the “Consolidate files” option and then click OK. Once you do this, your iTunes files will be consolidated. There are a few pros and cons of iTunes consolidating files. Read below. Once you consolidate files in your iTunes library, all your media files will be available in a single location. So it will easier for you to locate and manage your music, videos, etc. Another advantage of consolidating your iTunes library is that you will have all your media files backed up in a single location. So if the original files in the library get deleted, you will still be able to play the files in the consolidated folder. The only major disadvantage of consolidating iTunes library files is that it will take additional space on your computer’s hard drive. This is because the files in the new location after consolidation will be the copied ones and your original iTunes media files will also be on your hard drive, so it may be an issue if you have a limited space. If you don’t want to use iTunes to consolidate your iPhone files, then you will be glad to know that there are other ways to do this. One of those alternative ways is to use a third-party iPhone transfer tool called iMyFone TunesMate. It is the best iPhone files management and file transfer tool that bypasses all the restrictions of iTunes and offers numerous additional benefits. No need to launch iTunes to merge two iTunes libraries to your iPhone. 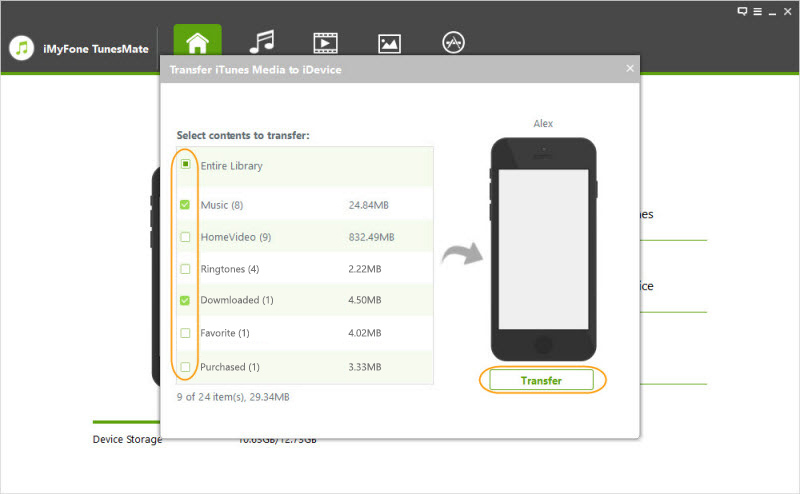 Preview your media files on TunesMate when selecting them before transferring. Consolidate files to iTunes library even from different devices and Apple IDs. All types of media files are supported including music, photos, videos, movies, playlists, podcasts, audiobooks, etc. Receives lots of positive reviews from Getintopc, Geekreply etc. Step 1: Use a compatible USB or lightning cable to connect iPhone to PC. Step 2: Launch iMyFone TunesMate on your computer. Your connected iPhone will be automatically detected by the software upon launch. 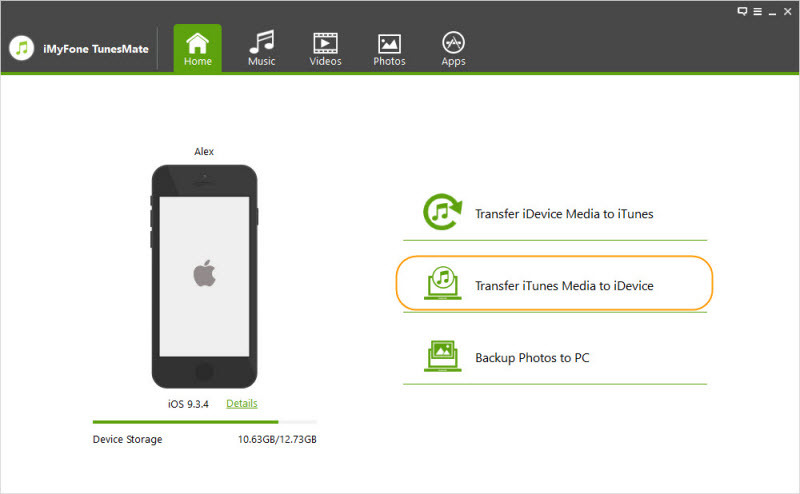 Step 3: Click on Transfer iTunes Media to iDevice option from the home interface of TunesMate. It will ask you to choose the media files you wish to transfer. Step 4: Select Music from the provided list and then click Transfer button. All the music files on your iTunes library will be transferred to your iPhone. You will also be notified once the transfer is complete. Click OK to finish the process.